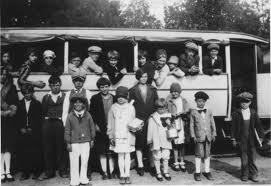 HISTORY...Sturgeon Bay is Door County’s only city and is the "County Seat". 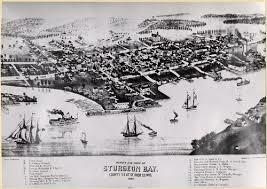 Originally known a "Otumba", Sturgeon Bay received its current name when it became a city in 1851. 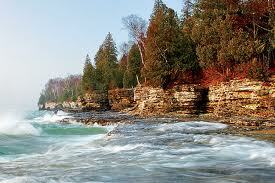 Sturgeon Bay is named after the great fish that used to fill the waters of this bay. Sturgeons were reported to be as much as 9 feet long in the early days. PLACES TO VISIT...Sturgeon Bay’s historic Third Avenue is a wonderful avenue to walk and shop. Here you’ll find On-Deck Clothing Store, Door County Confectionary, Gwendelyn’s, and Wilkins and Olander. For good food, Bob and I always enjoy the Inn at Cedar Crossing and Kick is a great place to grab your cup of jo to go! For pan fried perch, there’s no place like the Nightingale Supper Club, a traditional Wisconsin Supper Club. If you’re in the mood for a burger, stop by The Neighborhood Pub…good food in a welcoming sports bar atmosphere. I travel to Sturgeon Bay nearly every morning to swim and exercise at the Door County YMCA. You’ll find this YMCA facility to be exceptional. HISTORY...Just north of Sturgeon Bay is the Township of Sevastopol. Sevastopol actually extends Door County from Lake Michigan to the Bay of Green Bay. Sevastopol became a Township in 1869. It original name was "Laurieville" and when it became a Township it was to be named Sebastopol, but was written into the records with a "v" rather than a "b", so it has remained. Valmy and Institute are both unincorporated communities within this Township. PLACES TO VISIT...You'll find the magnificent Glidden Drive in Sevastopol. One or our favorite places for superior waterfront dining is Donny's Glidden Lodge. The food is exceptional and the setting outstanding...overlooking the beautiful shores of Lake Michigan. 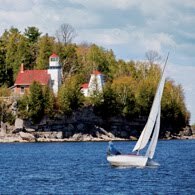 You'll find some great beaches and marinas in this area of Door County.